This modern desk clock is an elegant take on a staff appreciation gift. Glass with a frosted edge surrounds the clock body and highlights your custom engraved plate. 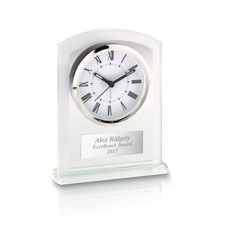 This classic engraved desk clock is perfect for employee motivation, whether it’s honoring senior employees or highlighting a special achievement.